How Can We Take Care of Our House? Like a body needs regular physicals, your home needs regular maintenance. Keeping up with the necessary care for your home will mean that your home will be able to last longer and help to preserve your home property value. While some home maintenance by homeowners is encouraged, not everything can be done by an individual. 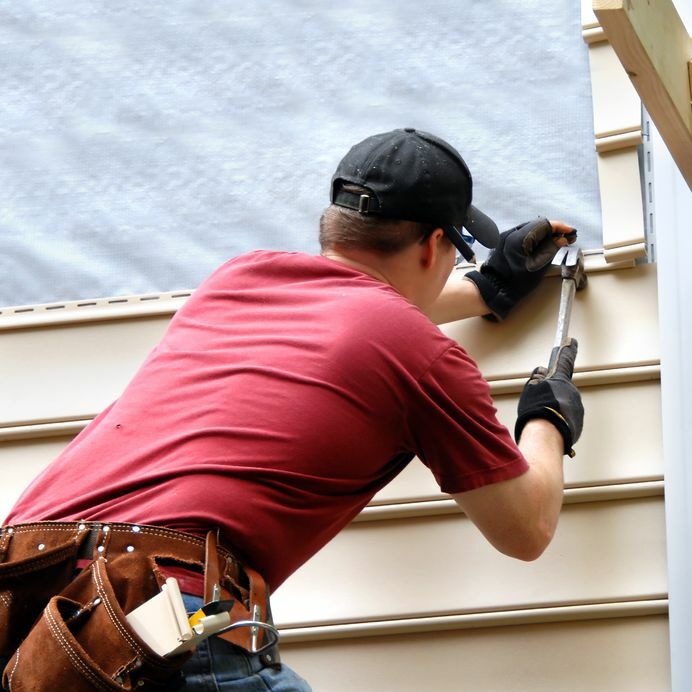 For big projects like home siding replacing, roof repair, and chimney cleaning, you might want to consider bringing in a professional. For help with home maintenance projects in the Berlin and Cherry Hill, NJ area, call Airborne Roofing, (856) 662-1382. Owning a home is a big responsibility and keeping with your home maintenance is important for many different reasons. Homes are a huge investment. No one wants to spend all that money and less than a year later, have to drop the same amount on a new home. That’s not what typically happens when you make the commitment to purchase a home. So home maintenance is important to help preserve and protect your investment. Following a regular home maintenance to do list is a great way to help you maintain your home structure and condition. Plus, it can help you keep your property value, which will help you later on should you decide to sell your home. So what is considered home maintenance? Home maintenance is taking the time to check the condition of appliances, the electrical work, the roofing, the exterior and the general condition of your home structure. This is something homeowners should always be doing, but it’s also something to bring professionals in for help with bigger areas. Every home will be different, but in general, these are things that every homeowner can can do to make sure their home is in it’s best condition. Home’s are a lot of responsibility, especially if you plan on staying in yours for several years. Taking adequate care of the condition and structure of your home is important to maintaining longevity. Things like having chimney cleaning in Bridgewater, NJ done professionally at least once a year will help make sure there are no existing damages that could be exacerbated by use during the fall and winter months. Working with a reliable and reputable contracting company will help make sure your home continues to stand strong. Airborne Roofing can help with your home maintenance needs in the Berlin and Cherry Hill, NJ area. Call us today at, (856) 662-1382, to schedule an appointment! When it comes to home maintenance and repair, there is a lot that can go right and a lot that can go wrong. As a homeowner, you should always feel capable of taking care of your own home, but there are several things to be aware of when maintaining your home. The fastest way to have serious, costly issues is by ignoring minor ones. Always call a roofer or contractor as soon as you see anything that could cause damage to the structure and condition of your home. The age of media has brought many helpful YouTube videos to our fingertips, but videos are not experience. The most common problem contractors find are the homeowners that tried to DIY a fix, but ultimately created bigger problems for themselves. There are also many home maintenance tools that private individuals will not have access to like a professional contractor. A regular maintenance schedule is always recommended to help you stay ahead of issues and prevent further damage from happening. This leads to homeowners having to pay more to repair and maintain their home. As a homeowner, you should always feel confident in maintaining your investment. Sometimes, however, it can save you more money to hire a professional roofer to help with things like replacing the siding on your home. How do I keep my house in good condition? Regularly schedule home maintenance inspections with a reputable company. Also, go through each month and just make sure high traffic areas and high-use appliances are clean, well-kept and free from damage. How can I maintain maintenance at home? Keep a home maintenance to do list you can do to (medical medical) in your home to maintain the structure of your home. It’s also recommended to schedule routine maintenance inspections at least once a year, but preferably twice a year. Depending on your schedule and budget, plan accordingly. 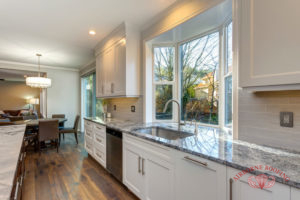 It depends on the value of your home, but a general rule is to save between $1,500 and $3,000 to cover the cost of repairs and home maintenance. Home Maintenance in the Berlin and Cherry Hill, NJ area! Regular home maintenance is critical to ensure the reliability and longevity of your home. Call Airborne Roofers, (856) 662-1382, for help with your home maintenance in the Berlin and Cherry Hill, NJ area. Posted in Uncategorized on March 6, 2019 at 9:38 pm by Airborne Roofing. A Leaking Roof Can Allow Considerable Water Damage to Your Ceiling, But Side-Effects are Even Worse. Have you ever discovered a leak in your rooftop? It’s a scary situation to find yourself in! You could be cleaning in the attic, or maybe you’ll have a professional there completing your residential air duct cleaning. Suddenly, you notice a steady drip of water coming off one of the roof supports. And that’s they best way to discover you have a leak. Other scenarios could result in significant degradation to your ceiling and support beams, or even mold growth. Today, we’ll answer some of the most commonly asked questions regarding rooftop leaks. We’ll also provide a basic game plan you can follow if your find your own leaking roof! Let’s get started. Airborne Roofing, we hear quite a few questions regarding repairs, insurance, and other important factors involved in a roof leak. While specific circumstances may cause some exceptions to the answers we provide, you’ll find that they ring true in the vast majority of these situations. Of course, you should always consult with a professional if you feel uncertain about your particular case. So you’ve found a leak in your roof, and you want to know if it’s worth calling the roofer for immediate assistance. If you can answer two questions, you’ll know the answer. Let’s tackle the first question. If water is actively spilling into the rooftop, your home will likely suffer serious damage in just a short while. That would definitely be an emergency. If you notice a small dripping of water inside the attic, you could probably afford to wait and simply place a bucket underneath. The first question typically answers the second. If you find your home in serious danger of water degradation because of a damaged roof, you need to call your local roofer for emergency repairs. Should you have a confirmed leak, it’s prudent to take the weather forecast into account as well. Impending showers mean repairs must be completed as soon as possible. Large leaks are typically easy to spot (on the underside). Dripping is an obvious sign, but also look for signs of moisture around the support beams. Keep in mind that the water seepage may appear a little distance away from the rooftop damage. After the rain has finished, you can assess the rooftop from the ground for signs of tears, curling, or cracks. Again, it’s smart to talk with a professional about roof leak detection. For every leak that you spot on the surface, there could be one or two more in a hard-to-see area. Handling these leaks in a timely manner is essential if you want to avoid more costly problems down the road. Can a Leaky Roof Cause Mold? Mold is practically everywhere, but it only becomes dangerous when given the right conditions. Ambient moisture and warmth allow mold to thrive inside your home, and those conditions will be met if your roof leak goes on for any significant time. In fact, once sufficient moisture is present, it only takes 2-3 days for mold spores to grow and start reproducing. After that time frame, you may be looking at costly water damage restoration. That’s another reason why prompt repairs are so important. In most cases, homeowners insurance will cover the cost of repairs if the damage was caused by an unavoidable factor. For instance, if a healthy tree fell over onto your roof and caused the shingles to start leaking, the insurance company would likely pay for the damage. However, if the leak was caused by pre-existing damage (such as clearly damaged shingles) that you could have had fixed, there’s a good change you’ll be on the hook for the subsequent costs. If Water Has Reached the Walls, You May Need to Remove the Insulation to Dry it Out. Those roof supports are critical to the health and safety of your rooftop. If they stay wet for too long, you could be looking at some serious wood rot. Damp insulation is also a problem, especially for fiberglass and cellulose. You can fix address both these problems with a fan and dehumidifier. The moisture needs to settle back down within the first couple of days to avoid mold. Your ceiling and walls also need to be looked at carefully. Lots of moisture will cause degraded areas, which will likely need to be replaced. 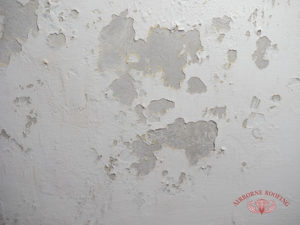 If you feel moisture in the walls, you’ll want to remove the insulation from the walls to allow it to dry. To do so, remove the baseboard (gently) and cut a small section from the bottom of the drywall. You just need enough roof to pull out the insulation. If you can dry it out within two days, your insulation should be fine. Otherwise, mold growth will force you to replace it. 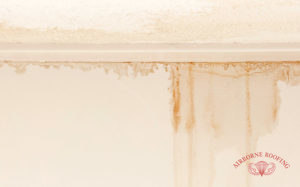 Fast action can help you avoid the majority of water damage. Need to schedule an inspection for your leaking roof? Our team at Airborne Roofing would love to examine your roof and supply professional repairs. You can rely on our team to take care of your metal roofing or fiberglass shingles in New Jersey. Give us a call today at (856) 662-1382! Posted in Uncategorized on January 2, 2019 at 8:46 pm by Airborne Roofing. A Professional Metal Roof Installation Offers Decades of Sturdy Weather and Fire Protection! Why metal roofing? That’s the question that many homeowners have to ask when friends discuss the roofing material. For crafting a roof system that provides lasting protection, their are few roofing systems that can provide the same impressive protection and efficiency. While the material does require a deeper initial investment, the superior waterproofing and energy efficiency is certainly worth the cost. How Energy Efficient is a Metal Roof? According to industry professionals, metal roofing can help you save as much as 40% on your air conditioning energy costs. Considering your heating and cooling systems account for almost half of your daily energy expenditures, that percentage represents hundreds (if not thousands) of dollars in savings. By insulating your interior air against outside temperatures, a metal roofing system drastically reduces the amount of electricity and gas needed to condition your home. Can Metal Roofing Go Over Shingles? Yes. In most cases, metal paneling can be easily placed over shingle roofing. The metal roof installation process is slightly altered in reroofing cases, but it’s a fairly simple job for experienced pros. After placing a special covering over the shingles, beams are affixed to the roof to serve as the attachment points for the new paneling. After the metal panels are connected to their respective anchors and the attachments are tightened. Presto! Installation is complete and your roof is ready to go! You won’t have to worry about tearing off the underlying shingles until the metal roof needs to be replaced, 50 to 60 years down the road. In the meantime, you’ll enjoy resilient storm protection and exciting energy savings. What are the Different Types of Metal Roofs? Believe it or not, there’s more than one way to install a metal roof! There are multiple metal materials available on the market, as well as varied style types. Finding the right roofing system for your home will hinge on your family’s budget and functional needs. The environment will also play a role. Below are a few prominent types of metal roofing. 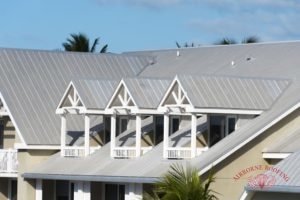 This method of metal roof installation comes in two varieties: corrugated and standing seam. Both offer impressive weather protection and energy efficiency, but their methods of installation vary somewhat. We’ll quickly break down their respective perks. Corrugated Panels Provide Very Sturdy Protection at an Affordable Price. One of the most accessible forms of metal roofing in Berlin and Cherry Hill, NJ, corrugated panels provide very capable protection against hail, wind, and fire. Panels vary in terms of gauge (thickness) and design, so you’ll want to consult with an expert about which sort would work best for your home. Maintenance requirements are minimal: only a tightening of the fasteners every ten years. Standing Seams Provide Great Waterproofing. One step above corrugated paneling, standing seam metal roofs utilize a series of vertically aligned locks to bind panels together without leaving any exposed seams. This creates a powerful waterproofing shield, and it makes for a very sturdy roofing system. There are two forms of standing seam metal roofs. Mechanical lock systems are utilized for steep rooftops, and these must be crafted folded by hand at the installation site. Snap lock roofs are for gently sloped rooftops, and they can be prefabricated ahead of time. Snap lock panels need only be “snapped” into place during installation. For either form of paneling, the upkeep requirements are practically non-existent. If the metal does start to fade (for whatever reason), a simple restorative coating can restore the color. Metal Shingles Can Emulate Other Forms of Premium Roofing Using a Special Finish. 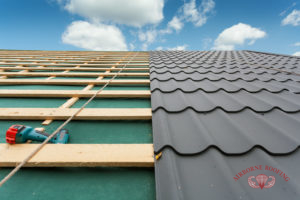 A very common form of residential metal roofing, metal shingles represent a happy union between traditional asphalt shingles and metal paneling. For homeowners that have grown fond of shingles in the past, this is an ideal metal roofing solution. Should you desire it, shingles can be covered with your choice of finish that simulates other premium materials, such as stone, wood, or tile. Metal shingles come in a wonderful array of colors for your style preferences, and they provide the same high standard of protection offered by other forms of metal roofing. 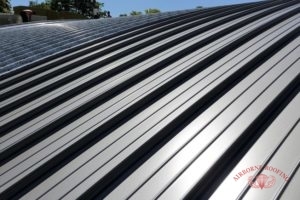 While there are a good variety of metals available on the residential roofing market, aluminum, steel, and copper are three of the most popular. Each has unique benefits that appeal to different homeowners, so it’s crucial to decide your family’s functional priorities ahead of time. Below, we’ll discuss the pros and cons of each metal in brief detail, so that you can make an informed choice! Aluminum is Practically Invulnerable Against Rusting and Other Forms of Corrosion. For homeowners that prioritize energy efficiency and cost-savings above all else, aluminum roofing is the perfect choice! As a naturally reflective metal, aluminum delivers impressive savings for your heating and cooling costs by deflecting a very high percentage of sunlight away from your home. The metal is also highly resistant against rusting and other forms of corrosion, so you won’t have to worry about rusting. Aluminum does start to fade after so many years, so it’s essential that you recoat or paint when it starts to lose its sheen. That way, you’ll enjoy those energy savings without interruption. Steel Roofing is Perfect for Larger Installations. Steel offers the most affordable material solution for metal roofing. Because steel is so plentiful and historically proven, its high value-per-square-foot is ideal for large roofing projects. Steel is particularly great with fancy finishes, which can be used to mimic other classic premium materials. As with any other metal, steel provides very strong weather protection. While the metal rarely shows signs of aging, steel needs to be galvanized or coated with a protective material to avoid rusting. Copper Roofs Often Last Over 100 Years! 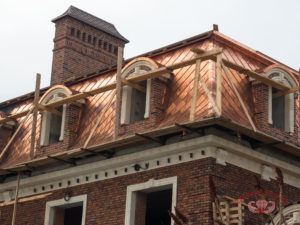 Considered by many to be the creme de la creme of metal roofing, copper provides outstanding long-term value. The metal is very pricey when compared to steel and aluminum, but copper roofing systems often last over a century. This material is highly resilient against weather damage and corrosion. As copper oxidizes over the years, it naturally develops a beautiful greenish-blue patina. This is why no copper roofing system looks the same. 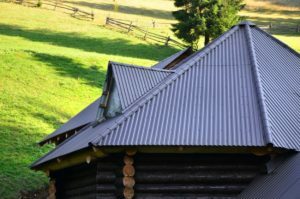 Which Metal Roofing is Best? While copper may be considered the “best” in terms of longevity and value, choosing the right metal roof installation will ultimately depend on your budget and functional priorities. If you need to cover a large house on a tight budget, consider steel roofing. Should energy-efficiency and corrosion resistance be your ultimate goal, try aluminum instead. Overall, it’s easy to see why metal roofing has become so popular. The peace of mind brought by the long-term protection alone is worth the price! When you add in the alluring energy savings and the fantastic customization options, it’s practically unbeatable. Posted in Uncategorized on October 31, 2018 at 8:19 pm by Airborne Roofing. During the Winter months, your home is at greater risk of damage because of extreme temperatures, snow and ice, and heavy winds. Ensure your home is ready to withstand the cold season with inspections and repairs for all of your major home systems. Along with your HVAC and plumbing system, your home needs a thorough roof inspection to prevent leaks, damaged material, and other problems that Winter perils may cause. 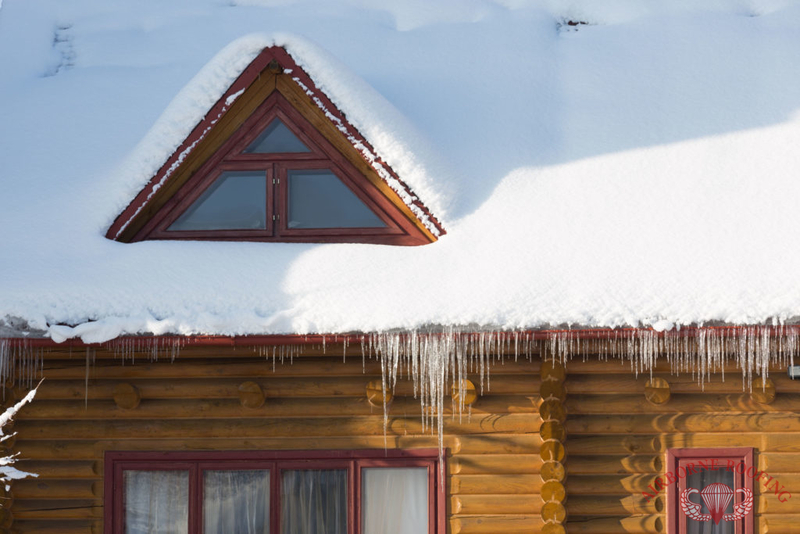 Snow, Ice, and Other Winter Weather can Have Detrimental Effects on Your Roof. As the leading cause of house fires and roof damage in the Winter, dirty heating ducts can also lead to big problems. Air duct cleaning in New Jersey should be completed by an expert technician along with Winter HVAC maintenance and can prevent house fires and minimize energy use. 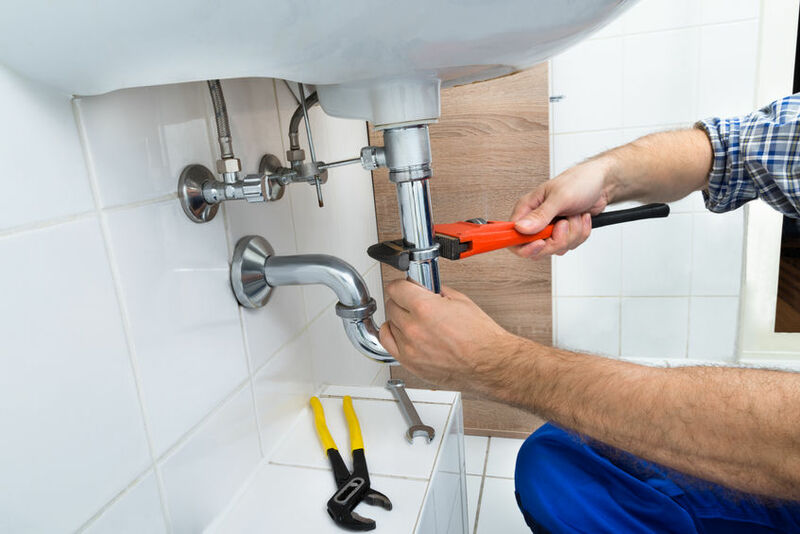 Plumbing maintenance and inspections should also be completed to prevent cracked pipes and low water flow throughout the Winter. These two inspections, along with a proper roof inspection, can save you hundreds on repairs and energy costs. 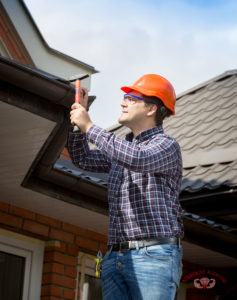 When it’s time for your Berlin and Cherry Hill, NJ home’s roof inspection, call the Airborne Roofing team first for quality work you can count on. We will inspect your entire roof and all secondary components, and discuss any repairs you may need. Call the Airborne Roofing team to ensure your home can withstand whatever this Winter season had in store. Posted in Uncategorized on September 21, 2018 at 6:32 pm by Airborne Roofing. Your Roof Plays a Key Role in Keeping Your Commercial Building Efficient. Many people worry about the energy efficiency of their homes, however, have you been considering whether your commercial property is energy efficient or not? The efficiency of these properties tends to fall by the wayside which is accepted as normal, whereas homes have a more sudden and visible impact and therefore handled quicker. Commercial buildings use more energy and have higher traffic than homes due to customer and personnel activity. This can lead to increased bills and even to wear on your systems from over use. In order to prevent this, you need to take specific measures. What are Energy Efficiency Measures? Luckily for commercial property owners, there are energy efficiency measures you can take to keep your property at its best and lower its usage. These steps work with systems that currently exist on your property and by improving them, you can improve not only the efficiency but the life of your building. Roof Coatings: With a roof coating, you can improve your roof, protecting it against damage while getting additional reflectivity. These coatings bounce UV rays away to keep your property cool. HVAC Systems: Your heating and air conditioning system should receive quality maintenance to keep them at their best. Contacting duct experts in New Jersey can ensure that your duct system stays clean and flows air efficiently. Lighting Systems: Using LED bulbs can light your business while reducing the energy drawn. These bulbs use less energy while providing quality light. Better Water Heater: How old is your current system? Older systems start to function less and less effectively, which is why a new system could help. These are just some of the steps you can take for your property. Want to get started on your property’s improvements? Airborne Roofing is here for you, providing quality roofing and roof coating for your commercial building in Berlin, NJ. Call us at (856) 662-1382 and speak with our experts about your property’s needs. Posted in Uncategorized on August 20, 2018 at 9:04 pm by Airborne Roofing. When it’s time to choose a roof replacement material for your home, most homeowners opt for either shingles or metal. Metal roofing offers substantial protection, low maintenance, and a reasonable price. Shingles can provide an affordable upfront cost, a variety of choices, and extreme durability. 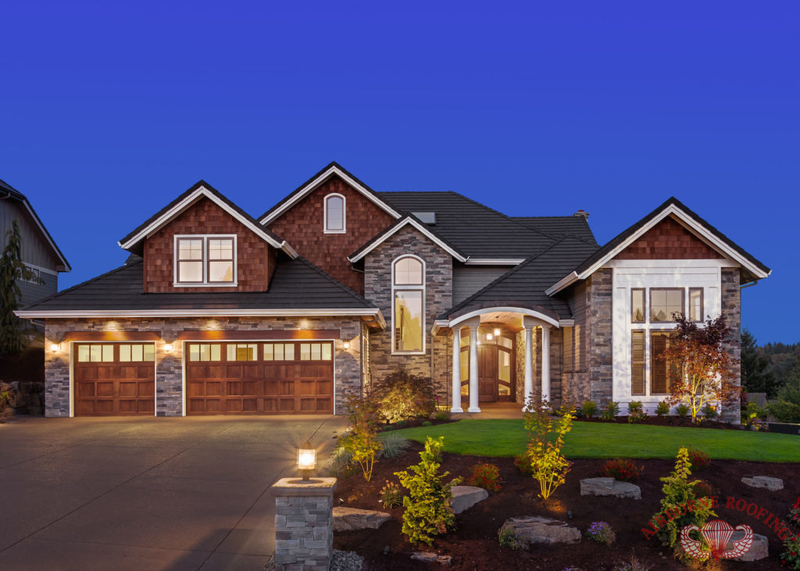 However, many homeowners don’t realize that the shape and style of their roof can greatly affect the reliability and durability of their roof material. The Best Roof Material for Your Home Depends on its Style and Construction. The pitch of the roof means the angle at which it’s built. Some homes have steep-pitched roofs while others have flat roofing. While shingles can be used on medium to steep-sloped roofing systems, they aren’t advised on low-pitched roofs because they do not provide effective water runoff. However, metal roofing works well on low, medium, and steep-pitched roof systems. When dealing with a complex roof, your material will need to be angled in many different directions. Because of this, metal roofing will have multiple seams that may leak or separate over time. Shingles, however, can be installed in multiple directions and with many flashing points without leaking or separating. While metal roofing offers abundant protection, the appearance of a metal roof system isn’t for everyone. However, metal tiles are now available and can resemble looks like tile, stone, wood, or even slate. Shingles, on the other hand, are versatile and traditional. These materials can now also provide lasting protection with options like impact resistant or synthetic. 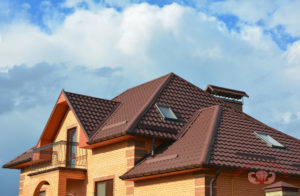 The Airborne Roofing experts can help you identify the ideal material for your home and complete your roof replacement in the Berlin and Cherry Hill, NJ area for a roof you can be proud of for years. Posted in Uncategorized on July 17, 2018 at 4:26 pm by Airborne Roofing. Windows in our homes are built to withstand a lot, but that doesn’t mean that they don’t need to be replaced from time to time. There are many signs that will indicate that window replacement service is needed and below we have listed some of the most common signs. Find Out If You Need Window Replacement Service. Windows are one of the best to keep the elements, however, when your windows aren’t properly insulated, they can cause drafts. With air coming in and out of your home through the windows, this can cause an increase in your energy bills. A window replacement will help combat this problem. Of course, we can hear the sound of birds chirping or a lawnmower in the distant, but if you are able to hear your neighbor who is several yards away from your home, you might have a problem with your window’s ability to soundproof. Getting newer windows will block out more sound. There are many reasons why your windows are hard to open and close. The balance of the windows could be off or the tracks are corroding, either way, opening and closing your window should happen without difficulty. Condensation should either be on the outside or the inside of the windows, but not in between the panes themselves. When there is condensation between the glass panes, its because the window isn’t properly sealed, which can either be repaired or completely replaced. 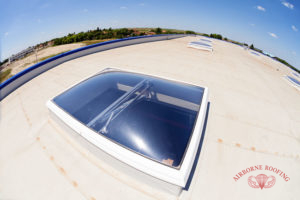 If you need window repair or replacement service in Berlin, NJ, call Airborne Roofing today at (856) 662-1382. Posted in Uncategorized on June 13, 2018 at 7:03 pm by Airborne Roofing. Our roof gutters are central to keeping our roofs and homes protected from water damage. Without a properly installed or working gutter, you can be sure your roof or foundation might be in trouble. Getting repairs is incredibly important, but knowing the signs will make it easier to call for repair service. Below are signs you need gutter repair service. Get Gutter Repair Service If Your Gutters Have These Issues. Typically, gutter systems will be securely installed up against the fascia, but when there is too much debris or pooling water is in the middle of the gutters, it can lead the gutters to sag. When this happens, its crucial to call our roofers for gutter repair service. There are several ways that your gutters leaks. One reason is that it’s full of leaves and debris, which can cause it to start leaking. Another reason is that the gutters are rusted and form holes for water to go through. 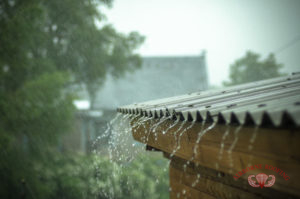 No matter the reason, when you see your gutters leaking, get gutter repair service immediately. 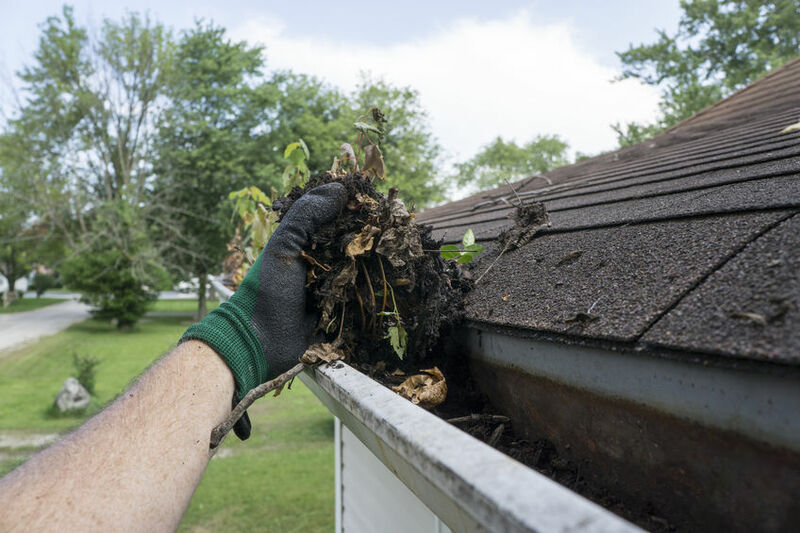 When gutters leak or are clogged with debris and leaves, it can cause water in the gutters to leak over. When this happens, it can cause water damage to your home. Usually, this is only for homes that have wood siding, but water pooling onto your home’s exterior wall can make its way to your home’s foundation and lawn, causing issues in those areas. Get in touch with the roofers at Airborne Roofing today at (856) 662-1382 when you need gutter repair in Berlin, NJ. Posted in Uncategorized on May 8, 2018 at 4:24 pm by Airborne Roofing. Roofs are typically an overlooked aspect when inspecting and falling in love with your dream home. But ignore a shoddy roof and you could find yourself shelling out up to $30,000 on top of the new deed and mortgage you just signed. To avoid the extra waste of money, read these tips on how to look for signs of roof damage when shopping for homes. Our Roofers Can Come and Inspect Your Home and Make Sure Your Roof is in Perfect Condition. Stand at a distance and see if you notice any of the following things: missing or curling shingles, rotting wood, or mold. Check for vents- you do not want to live in a dusty, humid, and moldy home. Poor ventilation can cause dry rot which makes your roof sag and crumble. While on a house tour, you will not be able to climb up on the roof and inspect the pipes, so it is important to ask about them. 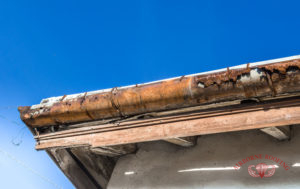 Faulty gutters can lead to leaks which will ruin furniture and cause mold and mildew. If the seller claims to have already done an inspection before putting the house on the market, ask to see it. You need to know what you are signing a deed for and moving into. Find out what year the house was built and when the last time the roof was repaired. Roof lifespans typically max out around 15 years. Another sign is comparing your potential roof to the neighboring roof styles. Is your roof style out of date or odd? Could be the previous homeowner’s decor aesthetic, or could be an indication of neglect. If you are interested in getting your roof inspected in BerlinBerlin and Cherry Hill, NJ, call Airborne Roofing today at (856) 662-1382. Posted in Uncategorized on April 4, 2018 at 4:43 pm by Airborne Roofing. When Do You Need a Roof Inspection? A roof inspection is something that should be done once every year. The reason for this is so that you never fall behind on roof maintenance and end up having to pay more for things like roof replacements or major repairs as time goes on. The upfront cost may seem like a lot, but it is usually not the case. If you make sure that every year small things are done and taken care of, your roof will never get a chance to get bad enough that you have to have an expensive roof problem. So in the end, it actually ends up saving you money. A new roof will often times come with some kind of warranty. The warranty is only good though, you have a roof inspection once every year. Like we mentioned above, this is to protect you and to protect the company from having to come out of pocket if you need a roof replacement one day or something has happened to the roof. It really is a protection for you and your wallet. A roof inspection will also give you the kind of peace of mind that you want. Worrying about your roof is the last thing you should be thinking about and with this, it won’t ever be something that you have to. When you need a roof inspection, don’t be afraid to call Airborne Roofing at (856) 662-1382. We will send a roofer to your home right away and get an inspection done. Posted in Uncategorized on March 1, 2018 at 9:52 pm by Airborne Roofing.